Every black child has heard this phrase growing up, “You have to be twice as good to get half as much.” It is ingrained in our psyche. It haunts us through grade school, high school, college, and even well into medical school. You would think upon entering medical school I would feel equal to my peers. If I’m here I’m certainly qualified. I worked just as hard, and overcame obstacles that most people wouldn’t have dreamed of facing. But sadly that anxiety of having to work twice as hard to prove yourself doesn’t go away, and the self-doubt looms, heightened by inadvertent comments about how it’s easier for people of color to get into medical school, how we must’ve gotten in because they got dinged for diversity, how they have some friend that totally deserves to be in med school but didn’t get in, as if we took their seat. I wish I could say the need to prove myself was solely an internal pressure. While I am sure some of my own insecurities played a role, the external pressures felt very real. I didn’t want anyone to expect less of me or my capabilities based on the color of my skin, or even worse, think that I was only here because of the color of my skin. Needless to say the first year I studied my life away. The fear of failure can be a huge catalyst. I vomited the night before my first anatomy exam. I had so much anxiety. When I received my grades back after the first block I was finally able to breathe a tiny sigh of relief. What I was doing was working, very well in fact, and I deserved to be here just as much as everyone else. Unfortunately, this didn’t stop anxiety from setting in and subsequent nervous vomiting prior to EVERY. SINGLE. EXAM. that semester. But I managed to get through that semester with great grades. I survived. I was proud. I was supposed to be here after all. Self-doubt is very real, it happens to the best of us. We all have that tiny voice in our head. I would be lying if I said there was a day that went by that I didn’t doubt that I knew something, hesitated to speak up for fear of being wrong, or doubted my preparedness for some exam or patient presentation. My first semester of medical school taught me to let that self-doubt be a motivator instead of a hindrance, and to help me stay humble. I know we all suffer from some degree of imposter syndrome, however as a female, and a minority female at that, I can’t help but feel that my degree is a tad bit more extreme. I consistently navigate spaces filled with people who look nothing like me. This can cause some serious lacks in confidence, but as I grew into my own (took more and more tests) and was forced to speak up and give an answer, my confidence in myself grew. Now here I am a seemingly confident 3rd year (because fake it til you make it right?) whose attendings consistently comment on my poise and confidence (faking it well?). Regardless to what anyone else may think, never doubt that if you are there -whether it’s an interview, a class, a degree program, a professional school, a sports team - you deserve to be, just as much as anyone else, you are just as qualified, just as capable, just as gifted. I really enjoyed this post, I completed my first year of school this summer and definitely had my share of obstacles and moments of anxiety so I could relate very well to some of your feelings/experiences. Congrats on making it this far! Checking the lapse date can help shield you from utilizing an obsolete item. Likewise, ensure that the item has not been messed with.here Most items will contain a plastic security seal that demonstrates that no one has opened the compartment. Hi! I'm Maura, a newbie OB/GYN resident, also known as an intern. 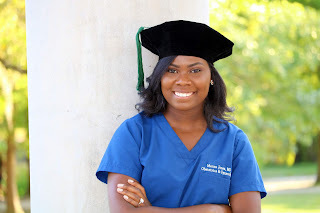 This blog will features various aspects of my journey as a woman of color in medicine and beyond, and will hopefully allow me to mentor others interested in a career in medicine. I am also a Medelita HIP Ambassador, be sure to check out their products!